It’s a busy week here at U.S. Translation Company. Especially for our boss, David Utrilla. 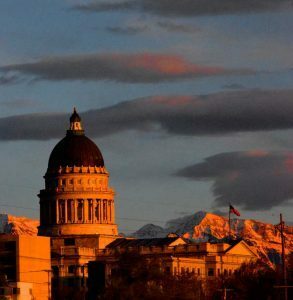 Utah’s Best of State recognized U.S. Translation Company with their translation award. Subsequently, David received an award of his own from the Utah Hispanic Chamber of Commerce. On May 20, 2016, David Utrilla attended Utah’s Best of State gala banquet on behalf of U.S. Translation Company. There, the organization presented him with the U.S. Translation Company translation award. David received it, of course, on behalf of the entire U.S. Translation Company team. Best of State. Again. Finally! It’s been three years since U.S. Translation Company won the Best of State translation award. Starting in 2009, we enjoyed a five-year winning streak, taking home the medallion in 2009, 2010, 2011, 2012, and 2014. Then, in 2013, 2014, and 2015, we experienced loss, beaten out by one of our competitors (with whom, needless to say, we enjoy a friendly rivalry). Utah’s 2016 translation award recognizes U.S. Translation Company as the winner in the Language Services category. U.S. Translation Company feels we deserve it, naturally. We work hard to maintain our distinctive “white glove service” and our tradition of excellence. It feels good to be back in the saddle, so to speak. As if Best of State were not recognition enough, David Utrilla personally received the Quixote Award from the Utah Hispanic Chamber of Commerce. The Quixote Award recognized David as Utah Hispanic Businessperson of the Year. For years, David has participated in the Utah Hispanic Chamber, promoting Hispanic businesses and the empowerment of Utah’s Hispanic entrepreneurs.